About Trans Siberian railroad. Transsib. Trip to Transiberian raiload. Tour to Transsib. Trans Sib. Trans-Siberian railway (usually called TransSib in Russia) is the world's longest and the most famous train route that goes through Russia. It crosses the whole continent, starts in Moscow, passes through the European Russia, crosses Urals mountains (which separate Europe and Asia), continues into Siberia's taiga and steppes, and finishes in Vladivostok — the Russian Far East coast on the Pacific Ocean. The Trans-Siberian is an immense route: along more than 9000 kilometers of its length you will see different landscapes, meet many different people and cultures (especially, if you hop off the train at few points), experience magnificent Siberian Baikal lake, and just enjoy the trip in the train. The original Russian name for this railway is "The Great Siberian Way", the name "Trans-Siberian" was given to this route by the West, and became very wide-spread. This railway is the backbone of Russia. It is the only overland route going through the whole country. This unique status makes the railway still quite important for the economy and safety of the country, as it was supposed to be more than 100 years ago, when it was built. It takes more than six days to travel along the whole Trans-Siberian, so it is recommended to make stopovers along the way — like this your trip will be much more interesting also. The Trans-Siberian Route: Moscow - Vladivostok – the original Trans-Siberian railway, which goes all along Siberia and through the Far East (to the Pacific Ocean). 9288.2 km (5772 miles) by the main passenger way. It's largest railway in the world. Beginning at Yaroslavsky terminus, Moscow - Vladivostok terminus. On January 1, 2001 is electrified on the Transsib 9019 km, or 97,1% of whole length of the railway (there was only one non-electrified section Guberovo - Ruzhino - Sibirtsevo on the Far East Division in length 270 km). 31st May 1891 when Tsar Nicholas I laid the foundation stone near Vladivostok and the work began and continued for fourteen years until 1901, when the East Chinese section was completed linking Russia with China. 18th October 1916, when the bridge across Amur river was finished near Khabarovsk. But it was only the end of the first section as others followed during the decades. Travel along the Trans-Siberian Railway is usually undertaken from west to east, though it is quite possible to go in the opposite. The Transsib crosses territory of 20 regions of the Russian Federation (14 - oblasts, 3 - krai, 2 - autonomy republics and 1 - autonomy oblast): Moskovskaya, Vladimirskaya, Yaroslavskaya, Kostromskaya, Kirovskaya oblasts, Udmurtskaya republic, Permskaya, Sverdlovskaya, Tumenskaya, Omskaya, Novosibirskaya, Kemerovskaya oblasts, Krasnoyarskiy krai, Irkutskaya oblast, Buryatskaya republic, Chitinskaya, Amurskaya oblasts, Jewish autonomy oblast, Khabarovskiy krai and Primorskiy krai. 89 cities are located on the Transsib: 5 cities with the population over 1,000,000 peoples (Moscow, Perm, Yekaterinburg, Omsk, Novosibirsk), 9 cities with the population from 300,000 up 1,000,000 peoples (Yaroslavl, Kirov, Tyumen, Krasnoyarsk, Irkutsk, Ulan-Ude, Chita, Khabarovsk, Vladivostok) and 75 cities with the population less then 300,000 peoples. 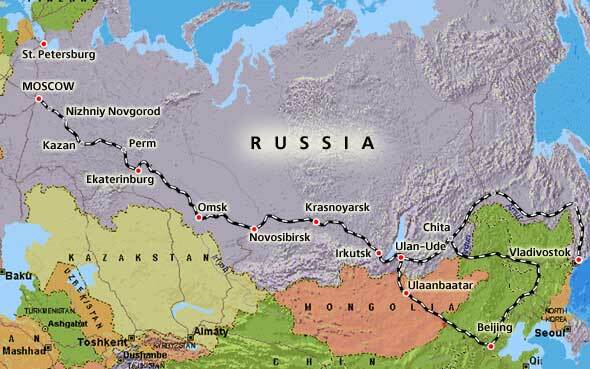 There is only one Transsiberian Railway but different routes are possible. The main route between Moscow and Vladivostok is usually taken by travelers. The Trans Manchurian Line which coincides with the Trans-Siberian as far as Tarskaya, a few hundred miles east of Baikal. From Tarskaya the Trans-Manchurian heads southeast into China near Zabaikalsk and makes its way down to Beijing. This route has a length of 9001 km (Moscow - Beijing). The Baikal Amur Magistrale (BAM) was started in the 1930s and officially opened 1984 after decades od sporadic work. It started in Taishet and reaches the Pacific ocean northeast of Khabarovsk, at Sovetskaya Galan. The 3.843 km long BAM runs several hundred km north of and parallel to the Transiberian Raiway. Even today, the BAM is not complete as one tunnel still has to be finished. This route is hardly found in any of the travel agency brochures outside the CIS. The reason for this is that there is actually no train doing the entire track. You have actually to hop different trains and sometimes even take the bus. Russia's Trans-Siberian Railway has long been an almost mythic experience. It is the longest continuous rail line on earth, each run clattering along in an epic journey of almost six thousand miles (or more then nine thousand kilometers) over one third of the globe. For most of its history, the Trans-Siberian journey has been an experience of almost continuous movement, seven days or more of unabated train travel through the vast expanse of Russia. A great part of the pleasure of such a trip is simply sitting back and watching the land go by. However, most travelers on the Trans-Siberian find that interaction with other passengers, both Russians and tourists, is what makes the trip an unforgettable experience. Today, with far fewer travel restrictions, it is possible to use the rail journey as the core of a more varied tour. Travelers can enjoy stopovers in many of the Russian cities and towns along the route, from the historic Volga port of Yaroslavl to Irkutsk and the scenic Lake Baikal region. The Transsib pass through territory of two continents: Europe (0 - 1777 km) and Asia (1778 - 9289 km). On Europe contain 19,1% of lengths of the Transsib; on Asia, accordingly - 80,9%. Stome memorial "Border Europe - Asia" is placed on the 1777/1778 km near Pervouralsk city.